← Sweet Dreams, Sleep Tight…Don’t Let the Bedbugs Bite! The U.S. is completing a two hundred thirty five year cycle from the Founders’ Republic into a nascent corporatist, totalitarian state that is arriving at near total power and inability to govern almost simultaneously. History, in other words, is repeating itself once more. And publicly at least, almost nobody seems to have noticed. It’s an old story. The Founders, Classical Liberals, threw a deliberately crippled, limited government and the resulting individual freedom at an enormous land full of nearly unlimited resources free to be used. That sucked in hordes of opportunists, many highly skilled, from more restricted precincts. The result was wealth untold that drew even more people who produced more wealth and America the Golden was born. But the shining city on the hill had large, dark slums too, full of folk who didn’t make it. Sometimes their own fault; sometimes, not. Regardless, they were open to politicians who promised to revoke the uneven distribution of the new land’s plenty in their behalf since they had failed to do it on their own. Thus the zeitgeist shifted from classical liberalism to what was to be called Progressivism that, since it depended on government control of affairs, was in fact watered-down socialism. It was accelerated by the disruptions of the Civil War. Today, the U.S. government regulates, i.e. controls, nearly everything to some degree but it hasn’t provided the promised nirvana of equality promised; on the contrary, we’re watching it all go down of economic mismanagement. Just as it has always done before; this cycle from freedom to control in the name of security is eternal in human history because we, homo not-so-sapiens remain unchanged as history unfolds. 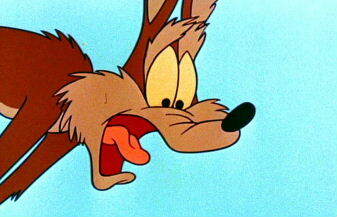 We’re the hapless Wile E. Coyote perennially chasing-but never catching-the roadrunner of a human made Garden of Eden. People aren’t the same; you nor government can guarantee equality of results. We must be satisfied with an equality of rights and on that, build our own results and abide by them. Fair? Sure… unless you believe someone somewhere owes you a rose garden. If so, I hope you collect better than our current population and their kids, it’s going to be a long, hard time. No matter who you elect. This entry was posted in Equality, Fascism, Fiscal/Financial Responsibility, Freedom, Liberty, Progressives and tagged Equality, Failed State, Fascism. Bookmark the permalink. Kind of you; let’s hope reality considers it fiction!